This page is updated regularly with best selling and highly rated slow cookers that currently have a special offer. These deals sell out fast so make sure you don’t miss out on these bargain prices. The Morphy Richards 48715A Slow Cooker has internal 4.5 litre working capacity meaning you can easily feed a family of four – with leftovers! It has 3 settings and the exterior is made of stylish polished stainless steel. A slow cooker is made to be left safely cooking while you go about your day so it is great for cooking stews, hot pots, casseroles and curries. Simply add your ingredients to the crock pot and your meal will gradually cook over the course of several hours. This slow cooker has an original price of £54.99 – see how much you can save below! This neat little 22730 Russell Hobbs Compact Slow Cooker has a 2 litre capacity meaning it’s fantastic for busy couples, students or those living alone. It also perfect for small homes, second homes, caravans, motor homes or even boats. Its compact size means that this slow cooker takes up very little space on the counter top and stores away neatly too. 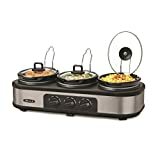 It has 3 different heat settings; high, low, and a warm function which is great for parties as it will keep food warm for long periods of time. It is easy to clean, has cool-touch handles, non-slip feet and a glass lid. A great accompaniment to any household! The usual price of this slow cooker is £34.99. 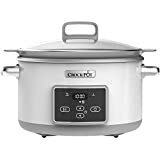 This large 5.7 Litre Slow Cooker from Crock-pot has a handy 5.7 litre capacity meaning you can make and serve tasty, easy meals for more than 6 people in one go! It benefits from having a digital timer and an auto keep-warm feature to ensure that your meal is ready when you are. The clever addition of a stirring system ensures that food is well mixed and does not stick to the side of the stoneware bowl. This slow cooker also doubles as a rice cooker, which is a very handy feature to have. You will also receive a recipe book to get you started on your way to slow cooker heaven! This digital slow cooker has a recommended retail price of £87.99. Let the Morphy Richards Sear and Stew Slow Cooker to add an extra dimension of flavour to your slow cooker recipes! Being able to sear your meat in the cooking pan allows the juices from the meat to combine with the rest of the ingredients, thus creating richer and fuller flavours in your meals! 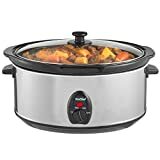 This very highly-rated slow cooker has three heat settings, is lightweight and has a non-stick coated aluminium pot which is durable and also benefits from being dishwasher safe meaning that cleaning up afterwards is easy. It serves 3 to 4 people and the toughened glass lid makes it simple to monitor the cooking. You will also receive an instruction booklet containing over 25 recipes, including soups, traditional favourites, curries and even desserts. 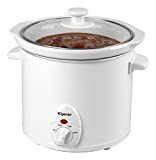 With an RRP of £34.99 this slow cooker is a great bargain, and it is also available in Red, Stainless Steel and Cream. This 5 Litre Crock-Pot DuraCeramic Sauté Slow Cooker is ideal for creating family meals as it can comfortably make enough food for five people. Features include an easy-to-use digital timer, two heat settings and an ‘Auto Keep Warm’ function which keeps food warm once cooking is complete. The ability to brown meat and soften onions and garlic beforehand adds a great depth to the final flavour of your slow cooker recipes. Both the lid and pot are oven-safe and the DuraCeramic coating is extra durable and easy to clean. With an RRP of £109.99, this is one of the more costly slow cookers, but it certainly is a high quality product with many features!